I bought some macadamia nuts thinking I’d make white chocolate macadamia cookies, but as usual I couldn’t resist the pull of actual chocolate and ended up making double chocolate macadamia nut biscotti instead. 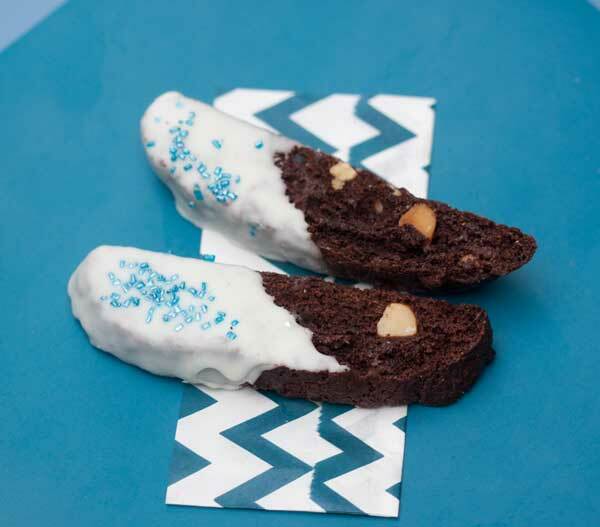 This is a good, solid, double chocolate biscotti recipe which may or may not replace my old favorite chocolate biscotti recipe . It has more flour and less butter so it’s a bit less rich and crumblier, but harder, crunchier and sturdier so it stands up really well to hot drinks. Preheat the oven to 325 degrees F. Line a 13x18 or other large baking sheet with parchment paper or a Silpat. Stir the flour, sugar, cocoa powder, baking powder, baking soda and salt together in a large mixing bowl. In a second bowl, whisk together the eggs, vanilla and melted butter. Pour the egg mixture into the flour mixture and stir to until dry mixture is completely moistened, then turn mixture onto a large flat surface. Gently knead in the macadamia nuts and chips. Divide dough in half and shape into two 11x 3 inch logs, spacing at least 3 inches apart, directly on the baking sheet. Bake at 325º for 30 minutes or until set and tops are cracked. Let cool for about 20 minutes, then transfer to a cutting board, cut diagonally with a serrated knife into 1/2" slices. Place cut side down on ungreased baking sheets. Bake at 300 for 25 minutes or until dry. Let cool on a wire rack. You can dip it in white melting "bark" or a little melted white chocolate mixed with coconut oil if desired. I used a brand called Rodelle. It's slightly more expensive, but worth it in recipes that use Dutch cocoa powder. These look fantastic, I’d love to try it!